We recently posted an article about sewing for charity and how to use your sewing hobby to give back to the community. Many of our readers share their thoughts and comments directly on the site in the comments section. Some write to me directly. I have to say I was blown away when I received Donna's email. The work she is doing is just fantastic and I asked her for permission to share her inspiring letter with you all and she agreed. You can find more info about the charity Donna is working with called Hope Totes, HERE. My name is Donna D., and I live in Stratford, Ontario Canada. This morning I was interested to read your email about sewing for charity, and I thought I would send along my sewing for a charity project. In late November 2016, I began sewing Hope Totes. Hope Totes is a non-registered charity that gives personal care products to women in need, usually women living in shelters. When arriving at the shelters, the women usually have nothing but the clothes they are wearing. Hope Totes gives them things like toothbrushes, toothpaste, deodorant and other personal care products. Last year Hope Totes were given out to women in shelters all across Canada. My journey with Hope Totes all began with a dream if you can believe it. I live in a theatre town, Stratford is the home to the largest repertory theatre company in North America, and although this little city is home to 30,000 residents, during the course of the theatre season, almost half a million people visit this city to take in the plays. Of course, actors are needed, and it is one particular actor that started me down this road. One night in September of 2016, a group of us went to a local restaurant where some of the actors were holding a cabaret. One of those actors was named Heather McGuigan, the same Heather McGuigan who about ten or eleven years ago started Hope Totes. It was a fun evening filled with lots of music, laughter and good friends, and that I thought was all. However the last week of November on a Sunday night, I had a dream about Heather McGuigan and her Hope Totes. I had heard about Hope Totes and knew what they were for, but that was all I knew. I thought about that dream that whole week, and finally, on Friday I found Heather's website and emailed her. In my email, I asked only about the actual totes. How many she used a year, how big were they, and what were they made of. The season had ended here, and Heather was then working in Halifax in a musical. She emailed me right back, and told me that she uses about three hundred totes a year, they are about 10″ x 12″, and she used either paper or plastic bags, but was looking for a source for fabric one. Well, I believe in signs and for me, there were four clear signs here, the first being that I had remembered the dream because I never remember dreams. The second was that Heather was looking for fabric totes. The third was that I had a large stash of fabric, yes I am a quilter/sewer, and just a few weeks earlier I had been looking through my stash thinking what will I ever do with all this fabric, I will never make it all up in my lifetime. The fourth for me was that Heather shares a name with my daughter, so all signs pointed to me that perhaps I should get involved somehow. I emailed Heather back and asked if I might make some totes for her, her reply came right back, asking how much they would cost. I replied that there would be no cost, and could I make up a couple of samples and send them to her so she could see them. She replied that she was standing in her rental kitchen crying she was so happy, and why didn't I make one and send her a picture. By Sunday I had the tote made and I sent the picture off to Heather, her reply, “they are wonderful, and I am once again standing in my kitchen crying, I am so happy”. My original goal was 1,800 totes, but by February of 2017 I had all be depleted my stash, which by the way feels great, and then something wonderful happened, friends and friends of friends began arriving at my door with bundles of fabric, and because I had so much fabric I decided that I could make 2,400. Then a friend arrived with a carload of fabric and the goalpost was moved to 3,000. My final goal is 4,000 totes, and last week I finished tote number 3,150, so I am moving ever closer to my final goal. This hasn't been a one-woman project, yes, I have sewn all the totes myself, but it would not have been possible without the kindness of many people, people donating fabric, and money to buy thread and lining, plus their encouragement. After sewing all my stash, and fabric began arriving at my door, I decided that I would not keep one single piece of donated fabric for myself, although there was one beautiful piece of red fabric that I just loved, but I went right to my cutting table and cut it up into totes. I try to keep away from drab and dark fabrics because I think the women receiving the totes should have pretty ones to brighten their lives, so any fabric that I cannot use I give to a friend who sews quilt tops for Victoria Quilts for cancer patients. I think when I reach the 4,000 tote mark, I will be very sad to see it come to an end, but I will also know in my heart that I was able in a small way to help 4,000 women. For the last two Christmases, my daughter Heather and I have filled twenty totes and donated them to a local shelter here in Stratford. Each year we have a Christmas party for our women friends and neighbors, and we ask that they not bring a hostess gift, but if they would like to bring along a personal care item for Hope Totes that would be appreciated. Last Christmas, we were able to fill each tote with seventeen personal care items, everything from toothpaste to a pair of warm socks, plus some chocolate, because everyone should have a little chocolate at Christmas. If I ever needed a reason to do this the look in the eyes of the manager at the shelter told me everything. I wasn't sure if I should send this or not because in one way it is kind of like tooting my own horn, but then I thought perhaps you might pass the suggestion of totes along to your readers and they too might make a few totes for a local shelter. I am sending along a couple of pictures of the totes. Thanks for your time, and thanks for your posting this morning. Hey there. You have inspired me. I might be 80 years old but can still sew. Would love to do totes for the women in Military. I’ve not been military but every person in my family is in law enforcement. I’ll contact Heather right now, Again thanks. It doesn’t matter what your age, you can always make a difference in someone’s life. I think making totes for women in the military would be wonderful, and I know they would appreciate receiving them. I’m crying as I write this from Birmingham, England, UK. Last week I discovered that the Salvation Army have a refuge for victims of domestic violence and their children, two miles from my house. They get very few donations of clothes and toys, because for obvious reasons they don’t advertise themselves or the location of their very anonymous building. I was actively looking for it and drove past it three times! I was wondering how I could help the 20 women and their children who live there. They turn up in the middle of the night with the clothes they are wearing. Now I know. Thank you, and thanks to so-sew-easy.com for sharing this. I wouldn’t have found you without them. A true example of serendipity. Serendipity indeed. I think that is a wonderful idea to help the women at your local shelter. Personal care items are always needed, and I know they would be very much appreciated. Should you need any help with the totes, if that is what you are going to be doing, just email Heather at https://www.heathermcguigan.com/hope-totes and she will give you my contact information. I’m amazed that one person could accomplish such an amazing number of totes! You and the recipients have been truly blessed! Many people don’t realize what a small gift means to a person with nothing. I am a member of a local quilt guild whose motto is “A guild with a purpose. We have 35 members who make quilt tops and several of us are longarm quilters and we do the quilting. We make baby quilts, large throw size quilts and twin bed size quilts. All of the fabric has been donated, some of the batting (wadding) is donated but most is purchased by the guild. Last year we made zip top cosmetic size bags for the kids at shelter care and filled them with toiletries. We applied iron on vinyl to the outside fabric so they’d stay dry and lined them. I think we made 60 of them. Our quilts last year numbered about 140. We also make seasonal placemats for Mobile meals clients and pillows for breast cancer and cardiac patients. This has been a very rewarding project for all of us and we try to beat our previous year number every year. Thanks for your letter. I think what your quilt guild does is wonderful. Making things with your hands is so rewarding, but the pleasure received from using your talents to give to others is something very special. You and your guild should be very proud of yourselves, keep up the good work. I want to use my sewing skills to help those less fortunate than myself after reading about the generosity of the above wonderful women who so humbly give of themselves!! Thank you all so much for sharing and your inspiration!! Thanks for your nice comments. If you do wish to get involved, you can contact Heather at https://www.heathermcguigan.com/hope-totes, and she would be happy to help you get started or make some suggestions as to what you could do in your area. There is no better feeling in the world than knowing you are helping someone else less fortunate. Hello Melanie…….I’m in country Victoria and I would like to steer you to the Share The Dignity website. I think it could be what you’re after. They do different things throughout the year and also do a special thing before Xmas to get donated, used, but good handbags to fill for women in the refuges. They had a few thousand donated via Bunnings who stepped up to be a drop off point in all their stores. At the moment they’re gathering feminine hygiene products. Hope this helps. Thank you for your kind words. I would suggest that you contact Hope Totes and I am sure Heather would be able to give you any information you would need. This is a wonderful way to help other women who are less fortunate and you will find that it will also enrich your own life. What a blessed story to read on Easter/Passover. I am involved with a group that donates payment of class fees to Laundry Love. The money is used at a local laundramat for homeless and those in shelters are able to wash clothes. Next winter some of us are making hats and mittens for all the wonderful people. Whatever their stories, they are being cared for in some small ways. We are happy to assist. What a wonderful thing you are doing to help others less fortunate. When I began making the totes, I had requests from my friends to help me sew the actual totes, and although I did appreciate their offers of help, this was something I felt I wanted to do myself. Thankfully they all understood, and instead brought me fabric and thread, and have offered me their support on this journey. If you do have some spare fabric that would be great and I can promise you that any fabric that I can’t use will be passed on to Victoria Quilts for cancer patients. and she will give you my email address. Thanks for your offer Dawn, it is very much appreciated. I know what you mean about not doing this for personal praise but getting a great sense of personal satisfaction. I had some fleece left from various projects and during a spell of bitter cold weather, I made a pile of pull on hats for homeless people and distributed them locally. I thoroughly enjoyed the task and hoped I had helped in some small way. What a wondering thing you have done. Although you might think your efforts small, I can tell you that the people receiving those hats would think you had given them a million dollars. Thanks for sending along the picture so I could see them. Well done. You comment about the totes, inspired me to write to you. I was never in the military, but my brothers, cousins, nephews, uncles all served; from WW1 to Afganistan. I am an 80 year old RN still working part time. I am also a quilt maker and sewist. I would be interested to learn about any program that you get started, because I would like to participate in some way. I too, have a huge stash of fabrics that would make nice totes to hold items for our returning female Soldiers. Let me hear from you and have a BLESSED EASTER. PS this picture is 10 years old so I have aged since it was taken. I think your idea of making totes for the military is wonderful. I would imagine a woman overseas, far from home would appreciate receiving a tote, not just because of what is in that tote, but to know that someone has remembered her. The same applies to members of the military returning home, I imagine some of them have pretty lonely lives, and would very much appreciate your kindness. If you need any advice with the actual totes, Heather will give you my email address, and I would be glad to help you. Good luck with this, it is a great idea. What a wonderful act of kindness. I, too, believe in signs and I totally understand your thought process. I also have a huge stash that I am trying to deplete. Maybe a sign will come to me for direction in accomplishing what you did. Thanks for sharing. We all need to read and hear more about acts of kindness and make a difference in this crazy world that seems to have lost some moral fiber. Thanks for your comments. Perhaps you could use up some of that stash and make some totes for your local shelter. I am sure once you make a start, you will find your friends and even people you don’t know will come forward to help. When I began making the totes, friends offered to help me sew them, but this was something I needed to do myself. I thought turning down their kind offers would be the end of it, but how very wrong I was, instead they began arriving at my door with fabric, thread and even personal care items to fill the totes. They have also been there to support and encourage me on this wonderful journey. I am sure she might be able to give you some advice on how to make a start. Perhaps my letter was a sign for you. By helping others less fortunate you are showing them kindness, and giving them a little hope, but you will find, that it will also enrich your life in ways you cannot even imagine. Hello!!! This is Heather McGuigan, the founder of HopeTotes-the charity Donna has so graciously devoted her time, generosity and Totes to. We are in awe of Donna and her devotion to our little charity and to helping others. We invite all of your to partake in HopeTotes initiatives in your communities. Please visit hopetotes.ca to find out more. You can write to me directly and I can help facilitate your projects!! we also have facebook and instagram @hopetotes where you can follow and see all the wonderful people, like yourselves, doing their part to make the world a little better. Oh, wow, just wow! Thank you so much for sharing Donna’s incredible story. I’m in total awe. I have so many scraps left from quilting projects that you’ve given me the encouragement and wayto put my skills to work as well. You tryly are a blessing! to good use and help others along the way. Should you need any advice to get started, you could contact Heather at https://www.heathermcguigan.com/hope-totes I know she would be glad to give you any advice you might need to get started. Thanks for your very kind words. I think it is wonderful that you are putting your sewing talents towards helping other women, at your local shelter. Keep up the good work, I know it will be very much appreciated by those receiving your totes. Donna, Your story is amazing and wonderful ! Thank you for this terrific idea on how to help others through our fabric stash and our ability to sew. I’ve been trying to come up with a good idea on how to use my own stash for the good of others. You have blessed so many with your talent and love but I’m sure those blessings have come back to you, too. Having been in a marriage with domestic violence decades ago, I cannot tell you how much your story means to me. God bless you! Thanks for your kind words. You are so right, when I began making the totes I thought I would simply be helping women less fortunate than I. I never could have imagined how much my own life would be enriched by this. I can tell you I have been moved to tears many times, by the kindness offered me, I have indeed been blessed. If you need any advice you can contact Heather at https://www.heathermcguigan.com/hope-totes I know she would be very glad to help you, and should you need any advice on the actual making of the totes, you can get my email from Heather. we decided that just a little tab worked best for our needs. Gosh Donna, how inspirational, are you! A wonderful story of your giving. So many women have been blessed by your giving of the bags and the personal items you put inside. Thank you for these very kind words. I started this project to reduce my my stash of fabric, but along the way a funny thing happened, I found the words “it is better to give than receive”, had taken on a deeper meaning for me . Although I know how much these totes mean to the women receiving them, they have also blessed my life as well. I don’t think I have ever been involved in any project that has given me such satisfaction, and for that I am truly grateful. tote, leaving an opening at the bottom of the lining so I can turn the totes inside out. I clip the corners of both the outside tote fabric and the lining before turning, then I turn it, making sure the corners are pushed out all the way, then I fold in the opening of the lining and sew that together. Then I fold the lining into the totes and iron it, so the only exposed seam is the little opening at the bottom of the lining which will sit inside the tote. I know that the women receiving your totes would be very grateful for your kindness. making sure the corners are pushed out all the way, then I fold in the opening of the lining and sew that together. Then I fold the lining into the totes and iron it. So the only exposed seam is the little opening at the bottom of the lining which will sit inside the tote. I am so incredibly proud of all the time and effort you have given to help other people and make someone else feel a little better. Thanks Rebekka for your lovely words. What started as a way to reduce my stash, has turned into a labour of love, and it has enriched my life tenfold. HI Tracy, thank so much for your lovely words, they have truly touched my heart. Donna D. (and all who help their charities,) are very special people, although I’m pretty sure she doesn’t see herself that way. All who support your charities, YOU ROCK! Hi Julie, thanks for your kind words. When I began this project I had no idea how much joy it would bring to my own life. I get to work with fabric, I get to sit at my sewing machine and sew both of which I love to do, and hopefully I will bring a little joy to someone else, who is less fortunate than me. Who could ask for more. I am also crying….you are amazing! My mother made over 600 totes for toys for tots and stuffed them for Christmas And I thought that was ambitious. I am going to begin working with care givers of transplant patients and was looking for an idea to brighten their day….you just gave it to me! I’m thinking totes with things to do to keep them busy at doc appointments…chocolate is a must. Bless you Donna! HI Debbi, thanks for your kind words. I have been told, when women are given their Hope Totes, many cry, they are so happy to receive a little kindness, and I am sure your totes will get the same reaction. Good luck on this journey, you will find it will fill your life with much joy. making sure the corners are pushed out all the way, then I fold in the opening of the lining and sew that together. Then I fold the lining into the totes and iron it. So the only exposed seam is the little opening at the bottom of the lining which will sit inside the tote. I would suggest sending Heather McGuigan of Hope Totes an email and asking her how you could get involved. Same here. Please share a pattern for these totes, I’d love to make some. WOW !! Congratulations !! You are such an inspiration !!!! Hi Lou Anne, Thanks so much for your kind words. This project has bought much joy to my life, and for that I am very thankful. This is such an awesome idea. Is there a tutorial for making these, i am not creative but can sew a bit. Hi Brenda, I don’t have a tutorial, but this is how I make the totes. This is wonderful. 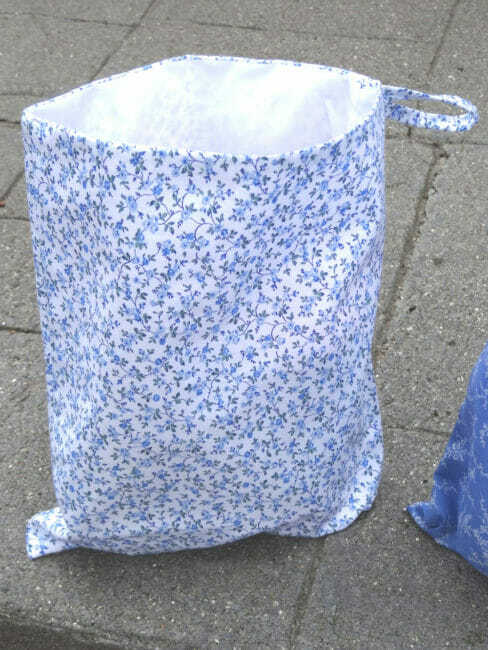 I have a large stash of fabric as well that needs to be used up, I would love to see a tutorial on how to sew a tote. I’m still a beginner sewer and I rely a lot on tutorials and patterns to make items. I would like to make totes and possibly donate them to a shelter here in Los Angeles. Hi Hilda, I don’t have a tutorial, but this is how I make the totes. making sure the corners are pushed out all the way, then I fold in the opening of the lining and sew that together. Then I fold the lining into the totes and iron it. So the only exposed seam is the little opening at the bottom of the lining which will sit inside the tote. I am sure the women receiving your totes will be very grateful for your kindness.